De Novo is the newest addition to the Minnesota Law Review family. The blog serves as a forum through which the staff, editors, and alumni of the Minnesota Law Review can contribute to legal thought and academic debate. De Novo features posts in a variety of forms: essays, policy briefs, legal reporting, case comments, and more. The blog serves as a vehicle through which the Minnesota Law Review community can reflect on the current legal landscape and further the discussion. Between 1,000-2,000 words in a Microsoft Word document, 12-point font, Times New Roman font, standard margins, double-spaced. Citations in endnotes using reliable sources that conform to The Bluebook: A Uniform System of Citation (20th ed. 2015). 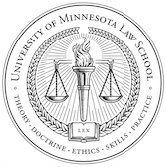 Current Law Review members, Law Review alumni, and University of Minnesota Law School faculty members may submit by email to mnlawrev.online@gmail.com. Experto Crede is the official podcast of the Minnesota Law Review.